Long time friend, Phil Green, fished the river yesterday 7/14/12, and here are a few flies that were effective for him. This is tied with Black Krystal Flash as tail, the body and the wing, with a Mercury glass bead. Can be tied with or without the bead in size 20 and 22. 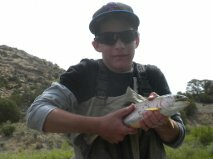 Jacob with his first flyrod fish and first San Juan rainbow. He was stoked. Awesome day on the water with Danny and Jacob!